MemberPress Downloads is designed to give you advanced access control and tracking of the PDF's, images and zip files that you share with your members. With MemberPress Downloads you can easily upload multiple files, tag or categorize them and list files with a single shortcode. You can even protect your files with MemberPress Rules just like you would any other content on your site. The days of using the WordPress Media browser are gone. With MemberPress Downloads you are now in control of all the content for your memberships, including the files. Most people will use MemberPress Downloads to allow their members to download files that are relevant to their membership or course. Examples of files might be PDF reports or reference documents that your members print for offline usage. It could also be template documents for your members to use. The plugin isn't limited to just documents. You might also want to upload photos or video for your members to view. Make sure your license key is activated on the MemberPress -> Activate page. After activating the license key visit the "Add-Ons" tab on that same Activate page and click the "Install" button next to the MemberPress Downloads entry. That's it, now you'll have a new "MP Downloads" menu item in your Dashboard. To upload your files you'll head to the MP Downloads -> Files page -> Add New. For this example we're going to upload a PDF file for members only. Enter a title for the File. Use something unique that will help you easily identify what this file is for later. Drag and Drop your file into the large space or choose "Select File" to select the file from your device's hard drive. That's it, now Publish your file. Now you can easily copy the shortcode and place it in your site's content. When viewing the details of an existing file you will see the name, slug URL which you can shared publicly, a preview of the file if its an image and the number of total downloads. You may also choose to organize your upload by using the "File Categories" or "File Tags". These are different than the categories and tags you may have setup in WP for posts and pages. For more information see the Categories and Tags section. 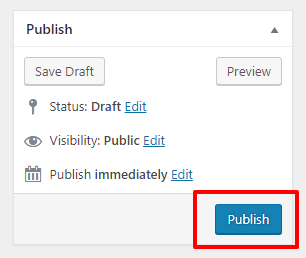 Once you publish the uploaded file, it is now accessible from the slug URL. You can use that URL to share with your members directly or use one of our shortcodes to place somewhere in your membership's content pages. See the shortcode section for more help. With MemberPress Downloads you can Categorize or Tag your files with its "File Categories" and "File Tags" features. These work just like the standard WordPress categories and tags for your Posts. Categorizing and Tagging files is a great way keep you files organized! But it has a few other benefits also. The biggest benefit is the ability to protect a large group of files with a single MemberPress Rule (see the Protecting Files section below for more info). There's two ways to Categorize or Tag your Files. Now that your files are uploaded and categorized/tagged. You're ready to protect the files using MemberPress Rules. You can protect your files using MemberPress Rules, just like any other kind of content you protect! You can protect individual files, files with a certain category, or files with a certain tag. In this example, we're going to protect any files that are tagged as "members-only". First visit the MemberPress -> Rules -> Add New page. 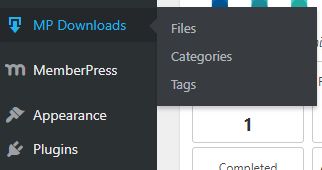 Select the "Files with File Tag" option from the drop down and then type in the tag you want to protect ("members-only" for example). Now set your Access Conditions on the Rule and save. That's it, now any Files you add that have the "members-only" tag will be protected from unauthorized users automatically. The MemberPress Downloads add-on comes with a few shortcodes you can use to display download links to your files. You can copy the shortcode to any file by using the link "Copy shortcode" under the file name in the Files list view. The following shortcodes are available to use with this plugin. Note: For advanced users all of the shortcodes mentioned below support a class="xyz" parameter which can be used to add a CSS class to the anchor tag for the file links. This can be used to add CSS classes to your download links to make them appear as buttons or otherwise styled differently than a plain link. The following shortcode will output a link that users can click to download the file. The following shortcode will generate a list of downloadable links which have the same tag. Replace "members-only" with the slug of the tag you wish to display. The following shortcode will create a list of downloadable links which have the same category. Replace "pdfs" with the slug of the category you wish to display.